Craft a unique and custom made chandelier using the Line-Low Voltage Round Canopy 11-Port Canopy LED by Tech Lighting. A one of kind chandelier is as easy as 1-2-3, simply select your pendants, then select the finish that suits your space and lastly install. 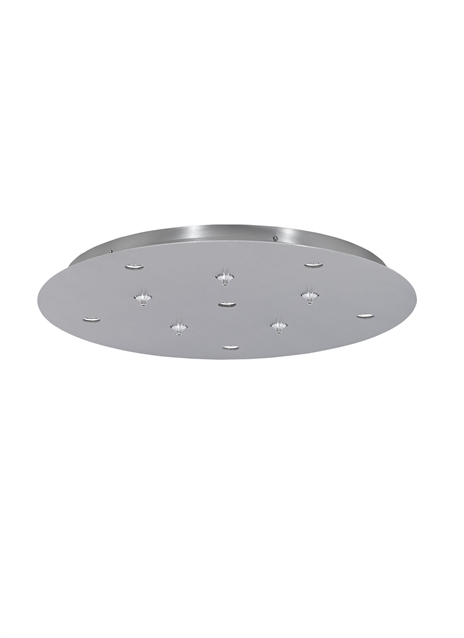 This multi-port chandelier canopy is ideal for both residential and commercial installations. Available finish options include a sleek and contemporary Metal finish. This canopy mounts to a standard 4" junction box with round plaster ring (provided by electrician). 24" Diameter Drywall anchors included for additional support. Includes electronic transformers, 5 low-voltage FreeJack ports, and 6 line-voltage PowerJack ports.